Oh so delicious, so so good for me and not as expensive or as much of a hassle as I used to think. I have had a juicer for about a year - it was a big purchase for me since I know most people buy one and then don't use it and for a while I only enjoyed it sporadically. Sometimes I made fresh juice but not consistently. Once I used it to juice massive amounts of already cut pineapple I found on sale and then canned the juice - that was awesome. Lately I have gotten into a nice routine with my juicer that is working out real well for me. About once a week I've been pulling out all the miscellaneous vegetables from the refrigerator, counters, baskets. I get the chopped up cilantro from the burritos we had three days ago, the salad that is wilting, the cucumber that was still left over when I bought a new batch, the last of the celery, a lone pepper I thought I would use in an omelet but didn't. I also use some vegetables and fruits bought specifically for the purpose of juicing like organic carrots which are pretty cheep at Costco and some organic apples I scored for a good price. I try to use what is in season (not apples right now but the price was right!) for it is more likely to come organic, be in better shape and best of all it is better priced. In the middle of winter my juice almost always has carrots and celery for they are cheep, delicious and always in season, right? This will be a ton of fun when my garden in in full swing this summer! I make enough juice to last me about a week. 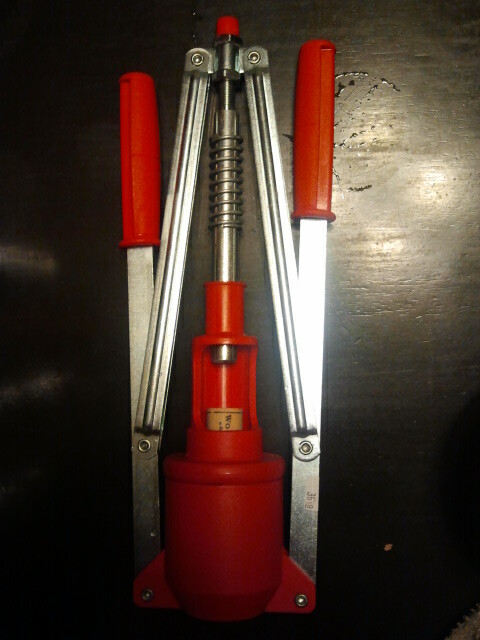 For me this makes juicing practical. I know myself well enough to know that I am not up for cleaning the juicer every single day. I really enjoy a glass of fresh juice in the morning and it also provides something for me to reach for in the afternoon when I am wanting to eat but not really needing a meal. One of the ways I have come to take care of myself just for the sake of taking care of myself is to provide nourishing food for me just because I want it - not because the kids do. While I would love it if my children drank a couple ounces of fresh pressed juice in the morning, they are just not into it. 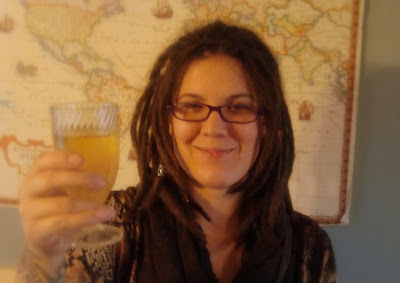 My daughter will drink a glass instead of eating a veggie if I'm serving one that is not her favorite but my son was born to eat vegetables raw and plain, unprocessed in any way. If I only ever fed him raw veggies from now on he would be happy. He actually hates the vegetable juice and doesn't care much for them cooked either but he will never turn down a fresh vegetable or fruit so I'm not complaining. My point is, I do this for me! I like having the extra serving or two of veggies - so easily digestible in this form, so cleansing, so nourishing. I am incorporating the weekly produce I already have on hand, making enough to last the whole week and increasing my vegetable intake and about that I feel good. ~ Be careful with garlic, onion, and cabbage - no matter how good they are, they can be overpowering if too much is used in a juice mixture. ~ I think it is worthwhile to get a good juicer, maybe not over the top but middle of the line at least. You will get more for your money in the form of MORE JUICE. freezer for a later use. ~ If you're so inclined, juice the foods that you would use in a vegetable or meat broth first. Before moving on to the next type of produce, set aside the pulp from those veggies and freeze it. When you make broth in the future don't even worry about adding carrots and celery etc., just pull out all that pulp from the freezer and use it instead! I've even successfully used juiced carrot pulp in carrot cake before. ~ Go on, add a pinch of salt, it won't hurt anything. ~ Don't peel your carrots, just rinse those babies. Also, use the leafs of the celery! ~ If you don't like to eat a particular food, you won't like to drink it. Though I try try try to like beets, I just don't. I juiced some thinking it would be a good way to get beets into my system. Guess what? I didn't much care for the juice. It took me longer than a week to plow through it. At some point you should rack the wine and eventually you may want to bottle and cork the stuff. Racking wine or beer is simply the process of siphoning the beverage from one vessel to another in order to leave sediment behind. 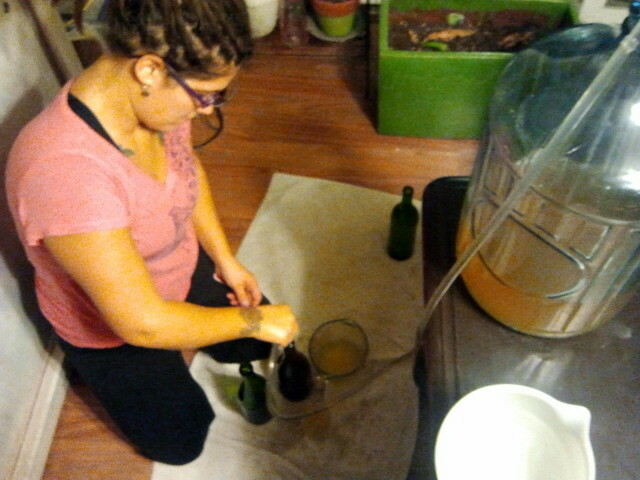 Siphoning is quite different from pouring. Pouring it will just mix the sediment back in. Siphoning leaves the sediment at the bottom of the vessel and also serves to aerate the beverage. It's great to use a local brew shop instead of ordering supplies online so you can take home a business card and actually call someone with question if they arise. You will need a Racking Tube and a hose that fits snugly onto the racking tube. It's important the hose fits tight or you won't be able to get a good suction. You will also need a cup or something with a narrow tip so you can pour water into the hose. 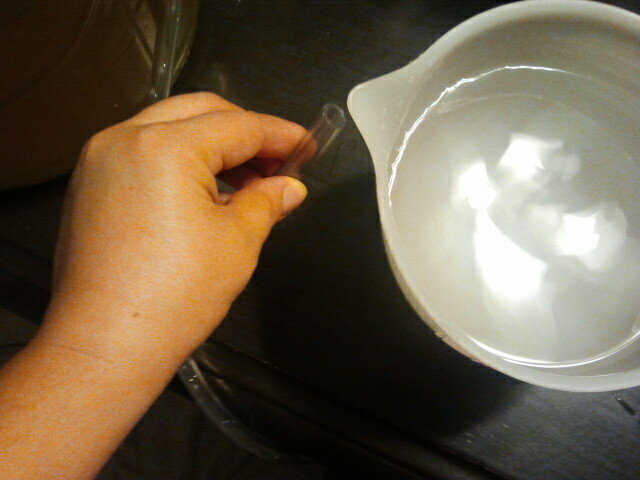 A plastic cup that you can bend or a measuring cup with a pour spout works great. 1. 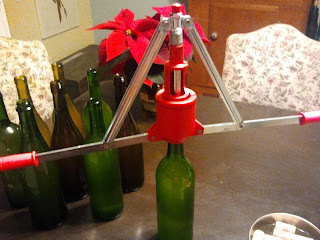 To start put the carboy on a table or counter so as to work gravity. Put some towels on the ground just for fun. On the ground have your clean receptacle to receive the wine and a bowl or something to drain the water used to start the siphon. 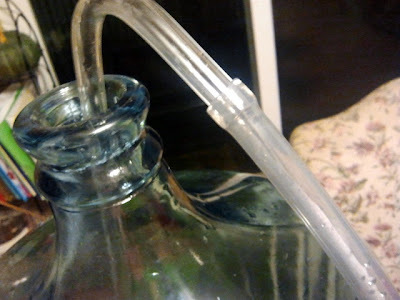 If you have someone who could suspend the racking tube up just above the sediment then use them, otherwise don't worry about it, jut place the racking tube in your carboy. 2. Fill the plastic hose with water but stop before the water goes down the racking tube. Carboy on the table with a racking tube resting inside attached to a hose. I am pouring water into the hose to get the siphon started. 3. Once the hose is full, with your finger on the end to keep the water in, aim the hose down then start emptying the water into a bowl. It will start to draw the wine into the racking tube and then the plastic hose. 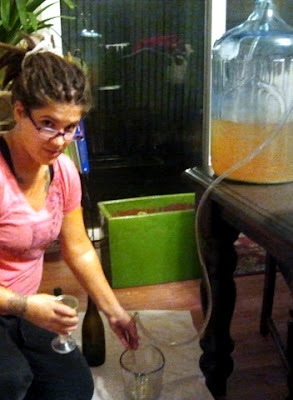 Once the wine hits, the first thing you should do is fill a glass for yourself to enjoy then start the transfer. Just pinch or bend the tube to stop the flow between vessels. First thing is first, poor yourself a glass to check on the flavor! 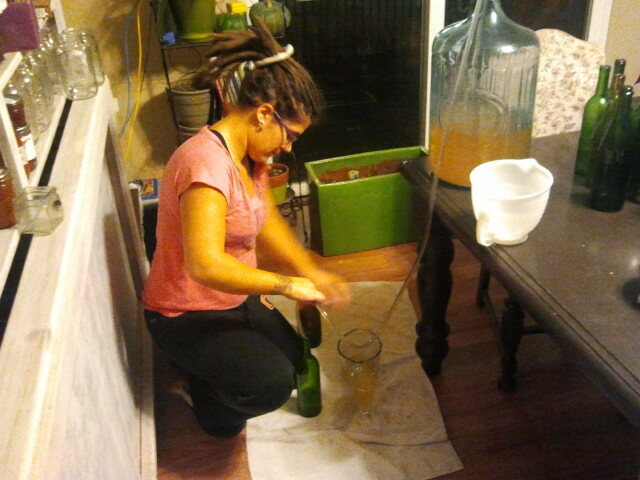 That's it, once you get it started, siphoning is not that tricky. If you don't quite get it on your first go, try again, you'll get it! When you get to the bottom of the wine where all the sediment is the suction will be lost. Sediment is packed full of nutrients, I hold onto it and use it in soups and roasts. 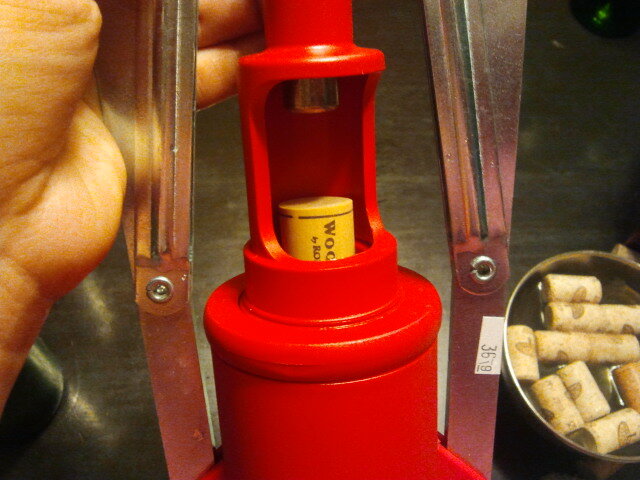 To cork a wine bottle you will need to buy a corker. I have a double lever corker which I spend $36.00 on. You will need some corks. I save all the synthetic corks from store bought wine, as long as it hasn't been punctured all the way through, and reuse them which is an extremely uncool thing to do in the wine world just so you know. I also bought a ton of cheap corks from the brew shop which I think are even a little too cheap in quality for me, I actually prefer my used synthetics. 1. If you use real corks, soak them in water prior to corking. 2. Slip the cork into the corker. 3. Place the corker on your bottle and firmly pull the lever handles down, down, and down some more. 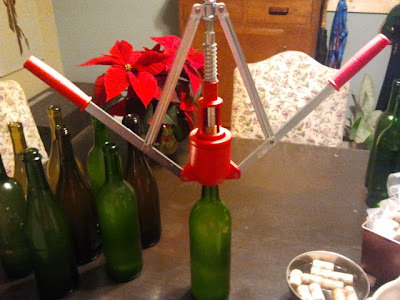 You will meet some resistance; just pull down hard and steady until the cork is wedged into the bottle. That's it, you're finished! Now place your beautiful wine bottles on the table and leave them there for a few days before you store them so you can revel in your awesomeness! The easiest up-cycle ever: Earring holder out of an old produce sack. I stole this idea from my friend Jenn who keeps her earrings on a piece of screen. It was easier for me to find a produce sack. 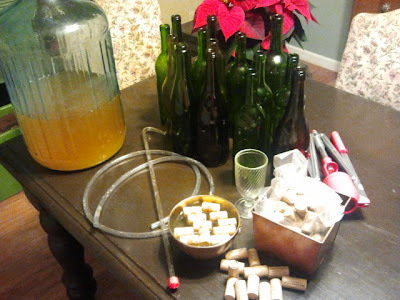 Mead is the easiest beverage you will ever ferment and it is delicious. as they are food grade. 1. Go to your local Asian restaurant and ask them for an empty food grade five gallon bucket. 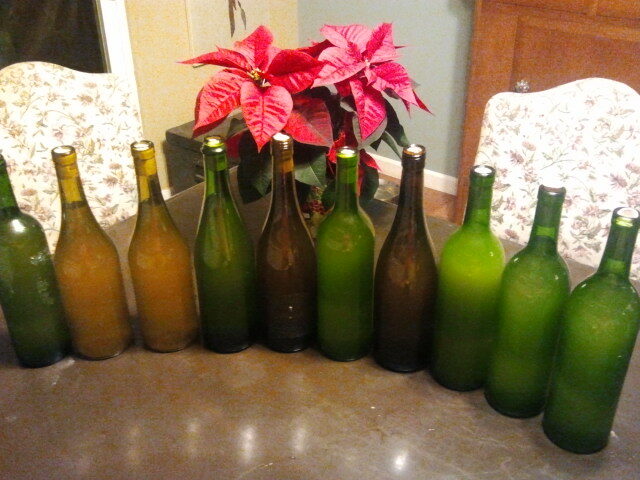 Smaller works fine too depending on how much mead you want to make. I offered to pay the lady at a local Chinese restaurant and she charged me $3 for each bucket which is way less than if I had bought it new. 2. Mix honey (preferably raw and local) and water in a 4:1 ratio. I used 2.5 gallons (40 cups) to 10 cups of honey. 3. Cover the honey water with a cloth. Check and stir it several times a day. It will start bubbling in a few days and it will smell deliciously sweet and fragrant! *Note: if at any point it gets mold or a film on top SCOOP THE FILM/MOLD OFF and stir. That's it, don't freak out, and don't throw it out. Scoop it off and carry on. I promise your wine will be okay. I decided to age it some more. This is a glass carboy with an airlock. 4. After it is good and bubbly (avg 4-10 days) depending on how warm your house is, transfer the mixture to a carboy and insert an airlock. Carboys are spendy, I highly recommend craigslist. I got a lot which included over seven carboys of different sizes for a real reasonable price off craigslist. Or ask your grandma to remove her penny collection from hers and let you have it. Option 1 - Let it sit for a month and viola, mead! Option 2 - Do as I did and bottle it, gift it to friends, taste it (again), realize it is way too sweet for your pallet and not fermented enough. 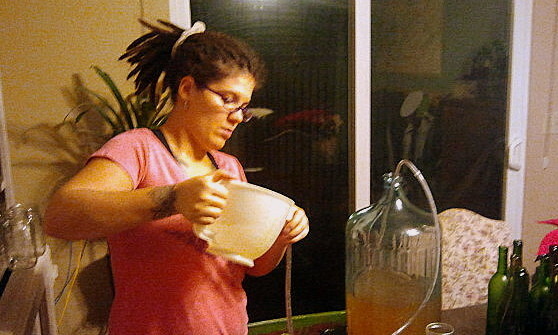 Return what is left from the bottles you still have to the carboy and let it ferment for a year. Option 3 - Rack it. That is, siphon it to another carboy or if you have only one, send it back to your five gallon buck and then back to the carboy. This step is not necessary but will get rid of the sediment and create a more clear crisp beverage. Let if ferment for about a year (or a couple more months - it's your mead, you decide) then bottle it! This is a delicious, nutritious beverage full of vitamins, minerals and probiotics. When aged to my liking it is a smooth, dry and full honey wine. Next time around I shall experiment with spices, fruit blends and/or unique honey/honey blends!